150 years ago, were I to tell you that someday people would walk on the Moon you might not have believed me. Surrounded by horses and steam, it may well have seemed an impossible dream. Now, nearly 50 years after the first footsteps in lunar dust, our collective perspective has shifted. Today the question isn’t “Will people walk on Mars?” Instead, it’s “Who will be the first?” The technological challenges of traveling to the red planet and returning to the blue are significant, to be sure, but we believe not insurmountable. The biggest question that remains is will it be this generation or the next willing to dedicate the effort to the take the next steps through the solar system. With this in mind, let us take the occasion of this summer to reflect upon how our knowledge of the red planet has exploded in the last 100 years. Why this summer? Because geometry. Both Earth and Mars orbit the Sun in nearly perfect circles, the key word being “nearly”. These "not quite circles" are called ellipses. You can think of an ellipse as sort of a squashed circle. The Sun offset from the center of the orbital ellipses of the planets. The Earth orbits at an average distance from the Sun of about 93 million miles. But because of its elliptical orbit, Earth is actually a little bit closer to the Sun in January, and a little bit further away in July. a two year period. Image not drawn to scale. Mars orbits 150 million miles from the Sun, and takes nearly twice as long to orbit the Sun than Earth does. Roughly every two years, the Earth and Mars end up being on the same side of the solar system. When Earth passes Mars in its orbit, Mars will appear directly opposite the Sun in the sky. Astronomers call this “opposition” and when a planet is at opposition it will also be at its closest point to Earth. That’s great news to astronomers who want to look at Mars. Being closer to Earth, Mars will appear bigger and brighter in the telescope. Sometimes, if astronomers are really lucky, the opposition of Mars will happen just as the Earth is at the furthest point from the Sun in its orbit, and Mars at its nearest point. That cuts a few million more miles off the distance between the two planets, making the red planet appear even brighter in the sky. That’s what happening this summer, making it an excellent time to go out and observe Mars. 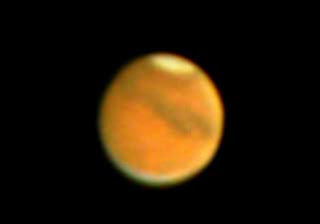 What does Mars look like and what can you expect to see this summer? is a good example of the kind of view to expect this summer. Mars is small. It’s a smaller planet than the Earth, but it has about the same land area. If you took all the continents on Earth and crashed them together, you’d get something about the size of Mars. And Mars is far away, even at its closest point. 36 million miles might be spitting distance in the solar system, but it’s still pretty far for human eyes to see. Through a small to medium sized telescope, an observer mostly sees a small, fuzzy, red disc. Before Cameras were invented, people drew pictures of what they saw to record what was visible in the telescope. They would wait for the brief moments when the air would steady and calm, and then map Mars as accurately as they could. Of course, they were still looking at a small, fuzzy, red disc so they only saw clear glimpses of the planet only briefly. The human brain is incredible at detecting patterns, ocassionally even detecting patterns where no pattern exists. Anyone who’s ever fallen for an optical illusion has experienced this before. Fuzzy data plus a pattern-detecting computer that sometimes gets things wrong can lead to bad conclusions. 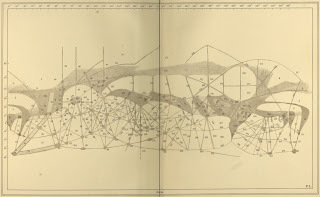 The Italian astronomer Giovanni Schiaparelli thought he saw grooves or channels cutting through the Martian surface during the opposition of Mars in 1877. He used the Italian word “canali” to describe them. This word was mistranslated into English not as “channels” but as “canals”. Channels could be formed naturally from the movement of wind or water. But canals? Canals are built by people. in his book Mars published 1895. American businessman Percival Lowell became so obsessed with Schiaparelli’s canals, that he eventually built his own observatory in Arizona, the Lowell Observatory. He believed the canals were a product of a Martian civilization building a vast network of aqueducts. These transported water from the ice caps of the planet to the desert-like regions near the equator. 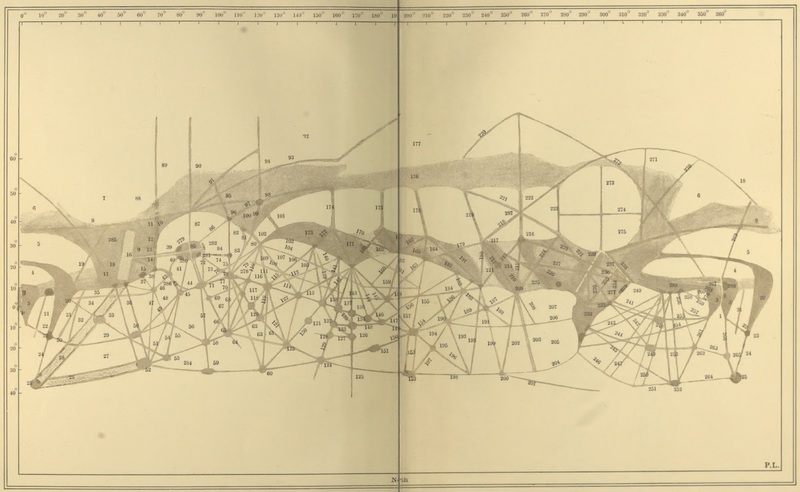 He drew maps of the huge engineering project he believed he saw spider-webbing across the surface. The network of canals didn’t actually exist. While the scientifc consensus had been that the canals were merely optical illusions for some time, it wasn’t until the Mariner spacecraft missions of the 1960s and 70s that the idea of Martian canals was finally put to rest for good. These probes found no hint of a Martian civilization, but the world they did reveal was perhaps just as interesting as the one some hoped they would find. Mars was engulfed by a huge dust storm when Mariner 9 entered orbit around the planet in 1971. Mariner 9 was the first spacecraft to orbit another planet, and scientists hoped it would send back the clearest pictures ever seen of Mars. The dust storm made it impossible to see the surface. The scientists waited months for the air to clear. In January 1972, as the dust was still slowly settling out of the atmosphere, Mariner started sending back images. The peaks of four mountains began to peek past the cloud tops. The mountains were tall, very tall. They would have had to tower above the surface. Each had to be about 20 kilometers tall to poke out through the clouds. The tallest was nearly 25 kilometers tall, two and a half times the height of the tallest mountain on Earth. Mars was going to be full of surprises. two and a half times as tall as Mount Everest. As the storm continued to dissipate, the dust lingered in the lowlands. It revealed the presence of a gash in the planet’s crust 8 kilometer deep, four times deeper than Arizona’s Grand Canyon, and nearly as wide as North America. The network of deep chasms that spanned one-quarter the distance around Mars was named the Valles Marineris, or Mariner Valley, after the spacecraft that discovered it. Mariner’s photos revealed a cold desert world, and paved the way for future missions to land on the surface. and reaches depths of 23,000 ft.
Each mission to Mars incrementally furthered our understanding of the red planet. Viking showed we could do useful science on the surface. Mars Pathfinder proved we could land cheaply. Mars Odyssey, Mars Global Surveyor, and Mars Reconnaissance Orbiter provided better and better images of the surface from space. Then came the rovers. Landing in January 2004, the Mars Exploration Rovers Spirit and Opportunity were designed to work for 90 Martian days, called 'sols'. Spirit worked for more than 6 years, and finally ceased functioning in 2010 after getting caught in a sand dune. Opportunity is still operating, and as of May 1, 2018 is on sol 5071 of its 90-sol mission. Both rovers sent back evidence supporting the idea that liquid water was present on the surface of Mars sometime in the distant past. The most recent rover to touch down on the red planet is the Mars Science Laboratory Curiosity. 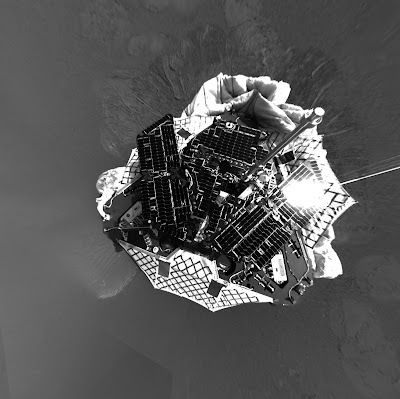 Curiosity landed in 2012 at Gale Crater. Since then it has been climbing the tall mountain located in the center of Gale Crater named Mount Sharp. By analyzing the rock formations that make up Mount Sharp, Curiosity has found evidence that Gale Crater was once filled with a lake of liquid water that may have had conditions suitable for life. 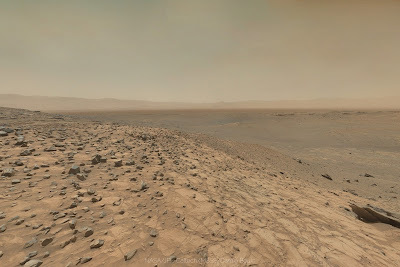 The rim of Gale Crater is visible in the distance in this image taken by the Mars rover Curiostiy. Each successful mission to Mars has increased our understanding of our neighbor planet, and each one brings us closer to sending the first people to land there. 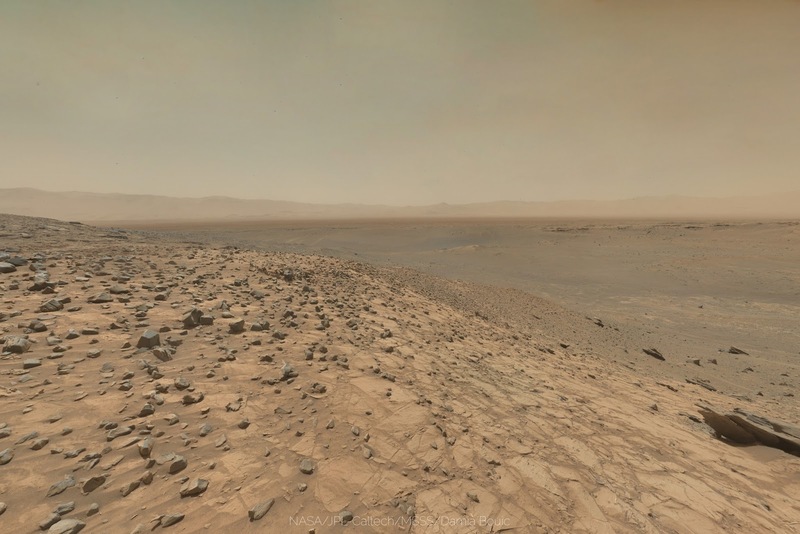 Every photograph sent back has revealed more of that distant world, and has transformed Mars from merely a red point of light in the sky to a place as real as any on the Earth. No longer consigned to the imaginations of science fiction authors, Mars is a destination for future human explorers. This mosiac showing a full hemisphere of Mars was created from 102 images taken by the Viking orbiters. The Valles Marineris is visible center, and at the left of the images are the three volcanoes of the Tharsis Plateau. 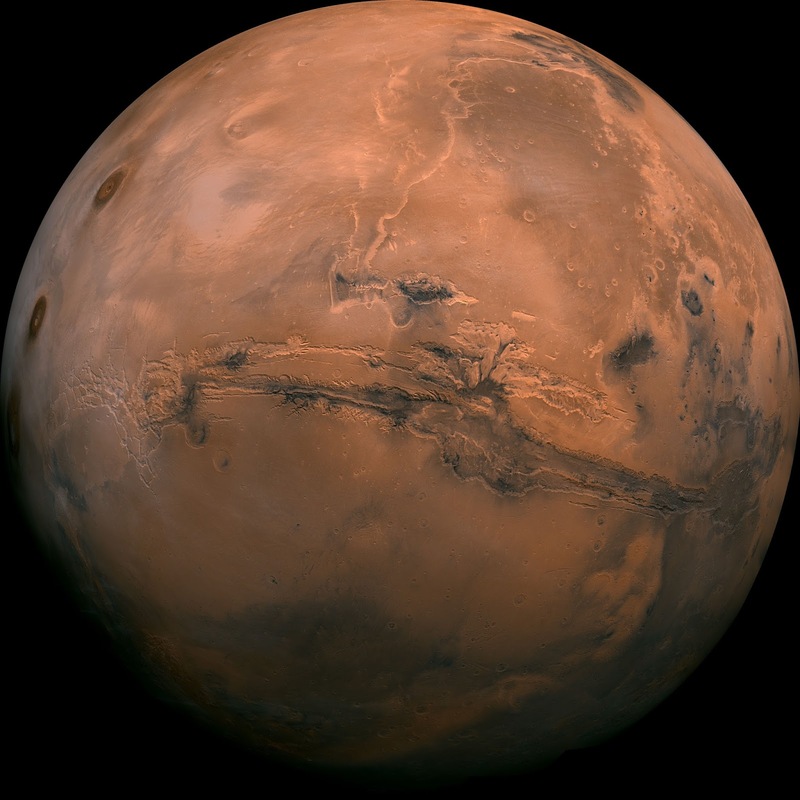 As part of observing the opposition of Mars this summer, the Delta College Planetarium and Learning Center will be hosting an exhibition of photographs taken of Mars. Visions of a Red Planet: The Photography of Martian Exploration features stunning images of Mars taken by orbiting spacecraft as well as surface robots. The exhibit runs May 11 through September 1, 2018. Located in the planetarium main lobby, the exhibit is free during all public open hours.